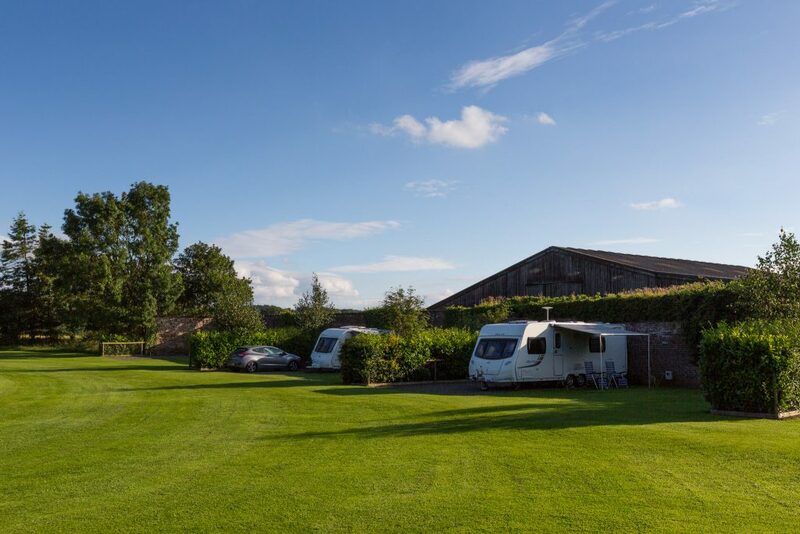 The site features five spacious pitches, each screened from the next by fencing and hedges. The site is surrounded on north, east and west sides by the original garden walls and on the south side by a screen of mixed pine trees. Each pitch is ten metres deep and around 20 metres wide. These large pitches are split into two sections. As you face into the pitch, the left-hand side is finished in durable hard standing, whilst the right-hand side is grass. This allows space for your car and caravan on the hard standing with plenty of access spaces around them, whilst your awning can be placed on the grass. Each pitch has its own drinking water supply and two 16A power hook-ups. Pitch One: Walled at the back, mature fenced hedges to both sides. Mature, tall, poplar trees directly behind. The pitch faces west, so will enjoy evening sun. Large trees to the rear can make getting Satellite signal more challenging! Pitch is around 65m (215ft) from recycling area, grey water disposal and chemical disposal points. EE 4G coverage is excellent. Pitch Two: Walled at the back and right-hand-side, with a mature fenced hedges to your left side. Mature, tall, poplar trees directly behind. The pitch faces west, so will enjoy evening sun. Large trees to the rear can make getting Satellite signal more challenging! Pitch is around 65m (215ft) from recycling area, grey water disposal and chemical disposal points. EE 4G coverage is excellent. On the right are pitches five, four and three (from left to right) Pitch 5 is vacant in this picture. Pitch Three: Walled at the back, mature fenced hedges to both sides. The pitch faces east, so will enjoy morning sun. Pitch is around 15m (50ft) from recycling area, grey water disposal and chemical disposal points, so is ideal for those with poorer mobility. EE 4G coverage is excellent. Pitch Four: Walled at the back, mature fenced hedges to both sides. The pitch faces east, so will enjoy morning sun. Pitch is around 30m (130ft) from recycling area, grey water disposal and chemical disposal point. EE 4G coverage is excellent. Pitch Five: Walled at the back and right hand sides, mature fenced hedges to your left side. The pitch faces east, so will enjoy morning sun. Pitch is around 50m (165ft) from recycling area, grey water disposal and chemical disposal points, so is ideal for those with poorer mobility. EE 4G coverage is excellent. 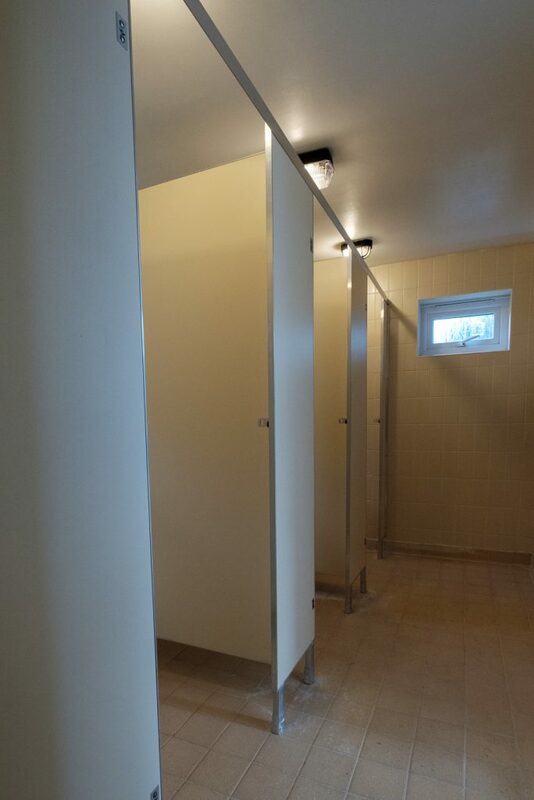 Access to CL Family Bathroom. Access to the bathroom via the most direct route is around 100m (300ft) from most pitches. Pitches two and three are closest, five is farthest away. This access requires adequate mobility to get up a few steps. For this using a mobility scooter, access via the main entrance to the site and the road is possible, although the gravel clippings in front of the bathroom may make the last few meters tricky for smaller ‘indoor’ scooters with small wheels. Access via this route is around 200m or 600ft from the centre of the site. Pitch one is closest. If you have any questions about this, please contact us directly. 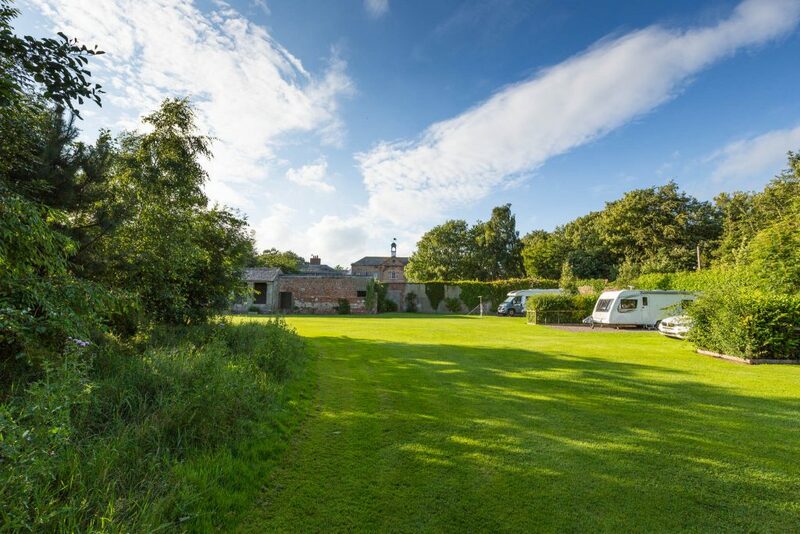 On the North edge of the site is a south-facing, semi-enclosed recreation area for picnics and barbecues, that may be enjoyed whatever the weather! 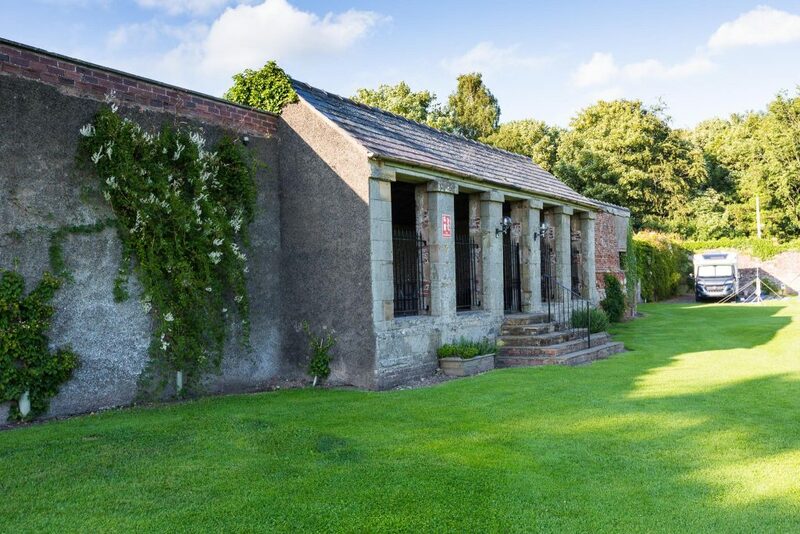 Adjacent to the CL site to the North is the estate Stable Block, which dates back to 1826. 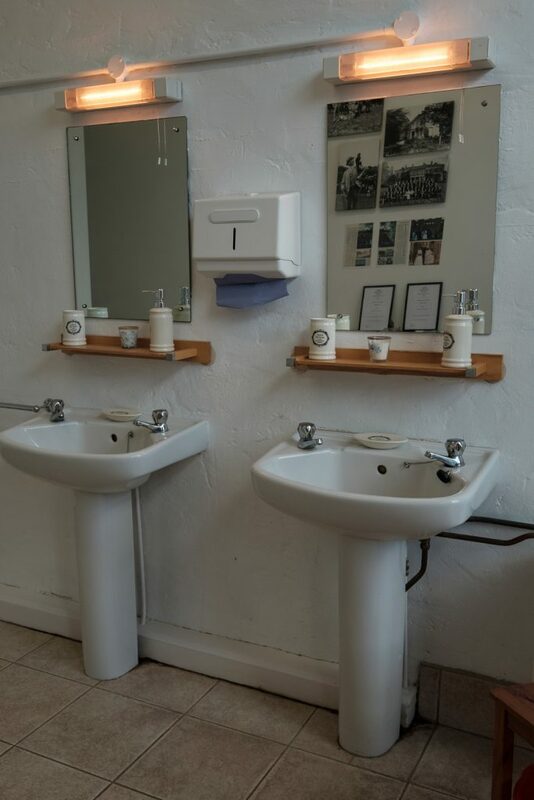 It features a beautiful grade II listed Georgian facade, within which, there is a family bathroom, which provides two separate toilet cubicles, two sinks with illuminated mirrors and electric razor points, plus a separate a shower room with four shower cubicles, each with an electric shower, storage stool and clothes hanging hooks. (Note for disabled customers: The shortest route to the bathroom requires the use of steps. For those who use a mobility scooter, access is possible via the main site entrance, although it is a little further).